Anne Morrow Lindbergh's Long-Lasting 'Gift' Married to one of the world's most famous men, Anne Morrow Lindbergh often chafed at the public attention she received. Her 1955 book Gift from the Sea, written on quiet Captiva Island, gazed inward at life, marriage and family. 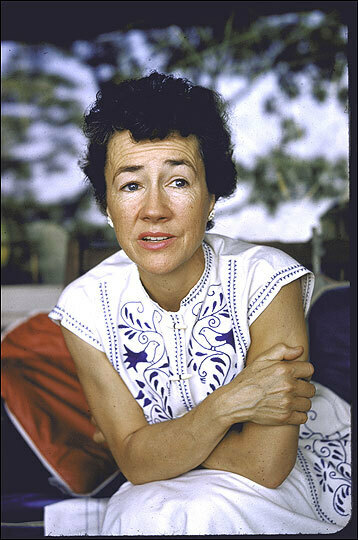 Anne Morrow Lindbergh photographed at home in Darien, Conn., in 1956. Writer Anne Morrow Lindbergh, the daughter of a respected U.S. diplomat, was vaulted into celebrity by her marriage to aviator Charles Lindbergh. The couple's travels in the early days of globe-trotting aviation drew breathless and often relentless attention from the media. Putting her literary talents on display before an adoring public, Anne Lindbergh also produced a list of best-selling books. Yet marriage to a vivid figure was not easy. The spotlight made Anne Lindbergh uneasy even before the 1932 kidnapping and murder of her first-born son. The infant was missing for more than two months, amid a hail of ransom notes, before his body was discovered near the couple's New Jersey home. Newspapers covered the case as "the crime of the century" and were equally omnipresent at the 1935 trial of Bruno Richard Hauptmann, who was executed for the murder in 1936. As World War II approached, coverage of the Lindberghs took another turn, as Charles Lindbergh offered generally admiring reports on Nazi Germany's development of the airplane. As the full import of Hitler's designs became clear, critics decried Lindbergh as a Nazi apologist. On Florida's Captiva Island, Anne Lindbergh enjoyed a brief respite from the obligations of family and career. There, using the shells on the beach for inspiration, she reflected on the life of the American woman in the middle of the 20th century. Anne Lindbergh died in 2001. 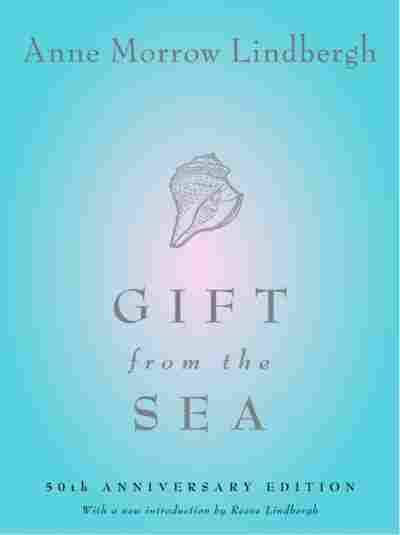 Reeve Lindbergh, the couple's youngest child, talks with Debbie Elliott about what may be her mother's best-loved book: Gift from the Sea. The sea does not reward those who are too anxious, too greedy, or too impatient. To dig for treasures shows not only impatience and greed, but lack of faith. Patience, patience, patience, is what the sea teaches. Patience and faith. One should lie empty, open, choiceless as a beach -- waiting for a gift from the sea. But his shell -- it is simple; it is bare, it is beautiful. Small, only the size of my thumb, its architecture is perfect, down to the finest detail. Its shape, swelling like a pear in the center, winds in a gentle spiral to the pointed apex. Its color, dull gold, is whitened by a wash of salt from the sea. Each whorl, each faint knob, each criss-cross vein in its egg-shell texture, is as clearly defined as on the day of creation. My eye follows with delight the outer circumference of that diminutive winding staircase up which this tenant used to travel. My shell is not like this, I think. How untidy it has become! Blurred with moss, knobby with barnacles, its shape is hardly recognizable any more. Surely, it had a shape once. It has a shape still in my mind. What is the shape of my life? We are all, in the last analysis, alone. And this basic state of solitude is not something we have any choice about. It is, as the poet Rilke says, "not something that one can take or leave. We are solitary. We may delude ourselves and act as though this were not so. That is all. But how much better it is to realize that we are so, yes, even to begin by assuming it. Naturally," he goes on to say, "we will turn giddy." Naturally. How one hates to think of oneself as alone. How one avoids it. It seems to imply rejection or unpopularity. An early wallflower panic still clings to the world. One will be left, one fears, sitting in a straight-backed chair alone, while the popular girls are already chosen and spinning around the dance floor with their hot-palmed partners. We seem so frightened today of being alone that we never let it happen. Even if family, friends and movies should fail, there is still the radio or the television to fill up the void. Women, who used to complain of loneliness, need never be alone any more. We can do our housework with soap-opera heroes at our side. Even day-dreaming was more creative than this; it demanded something of oneself and it fed the inner life. Now, instead of planting our solitude with our own dream blossoms, we choke the space with continuous music, chatter and companionship to which we do not even listen. It is simply there to fill the vacuum. When the noise stops there is no inner music to take its place. We must re-learn to be alone. We all wish to be loved alone. "Don't sit under the apple tree with anyone else but me," runs the old popular song. Perhaps, as Auden says in his poem, this is a fundamental error in mankind. For the error bred in the bone/Of each woman and each man/Craves what it cannot have./Not universal love/But to be loved alone. Is it such a sin? In discussing this verse with an Indian philosopher, I had an illuminating answer: "It is all right to wish to be loved alone," he said, "mutuality is the essence of love. There cannot be others in mutuality. It is only in the time sense that it is wrong. It is when we desire continuity of being loved alone that we go wrong." For not only do we insist on believing romantically in the "one-and-only" -- the one-and-only love, the one-and-only mate, the one-and-only mother, the one-and-only security -- we wiish the "one-and-only" to be permanent, ever-present and continuous. The desire for continuity of being-loved-alone seems to me "the error bred in the bone" of man. For there is no "one-and-only," as a friend of mine once said in a similar discussion, "there are just one-and-only moments." But is it the permanent symbol of marriage? Should it -- any more than the double-sunrise shell -- last forever? The tide of life recedes. The house, with its bulging sleeping porches and sheds, begins little by little to empty. The children go away to school and then to marriage and lives of their own... What is one to do -- die of atrophy in an outstripped form? Or move on to another form, other experiences? Intermittency -- an impossible lesson for human beings to learn. How can one learn to live through the ebb-tides of one's existence? How can one learn to take the trough of the wave? It is easier to understand here on the beach, where the breathlessly still ebb tides reveal another life below the level which mortals usually reach. In this crystalline moment of suspense, one has a sudden revelation of the secret kingdom at the bottom of the sea. Here in the shallow flats one finds, wading through warm ripples, great horse conchs pivoting on a leg; white sand dollars, marble medallions engraved in the mud; and myriads of bright-colored cochina-clams, glistening in the foam, their shells opening and shutting like butterflies' wings. So beautiful is the still hour of the sea's withdrawal, as beautiful as the sea's return when the encroaching waves pound up the beach, pressing to reach those dark rumpled chains of seaweed which mark the last high tide. Perhaps this is the most important thing for me to take back from beach-living: simply the memory that each cycle of the tide is valid; each cycle of the wave is valid; each cycle of a relationship is valid. And my shells? I can sweep them all into my pocket. They are only there to remind me that the sea recedes and returns eternally.